Crystal Clear Window Washing offers professional Gutter Cleaning services to San Diego and North County residents/ business’s. 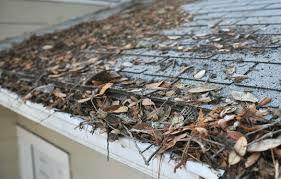 Neglected gutters can lead to clogs causing rain water to back up and over flow. While this is obviously not an ideal situation this can also cause serious damage to your home. Clogged gutters fail to properly drain rain away from your home potentially leading to a sagging gutters, leaky roof, water damage to the interior/ exterior of your home, and even a failing foundation. Your time is valuable and you have more important things to do, so when it comes to gutter cleaning, allow the professionally trained staff at Crystal Clear Window Washing to do the dirty work. While some other companies might use leaf blowers and pressure washers to clean your gutters, Crystal Clear Window Washing does all gutter cleaning by hand. Besides creating a new, bigger, un-contained mess; leaf blowers and high pressure washers can rip the gutters right off your roof line, and force water into places that it shouldn’t be. Thus causing the exact damage you were hoping to prevent by cleaning your gutters in the first place. Sign up for a “regular maintenance” program and never worry about your dirty, clogged, gutters again. We’ll check your gutters at every visit and clean them at regular intervals ensuring that your #1 investment, your home/ business, stays in pristine condition.